Thank you for visiting our virtual showroom! We know that buying a car is a big decision that can be intimidating. At Genesis Auto Sales, we strive to help make this process as easy & stress free as possible. 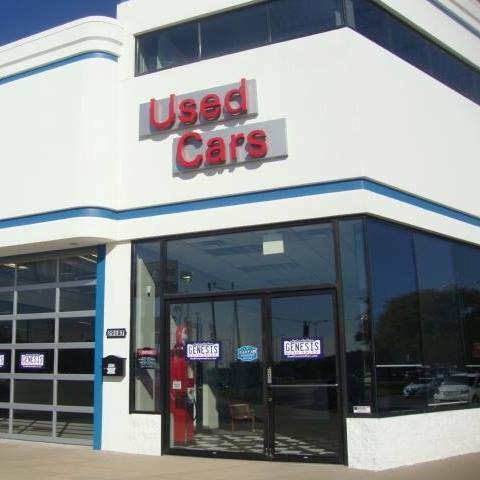 We promise not to be your stereotypical used car dealership- no high pressures sales tactics, no hidden fees, no surprises at signing. Genesis Auto Sales on Gratiot Avenue in Roseville Michigan, is a division of Genesis Automotive Group which operates Genesis Cadillac in Saint Clair Shores & Genesis Chevrolet in Eastpointe, Michigan. As a division of a new car dealer group we offer high quality vehicles & attractive financing options that you may not be able to receive from a typical used car lot. Please take a look at our current offerings. If, however, you do not see exactly what you are looking for, contact us. We have over 150 pre-owned vehicles in stock within our dealer group & we can almost always locate the exact vehicle you are looking for through our large network of industry connections. We are convieniently located at 29187 Gratiot Avenue just north of 12 Mile Road on the Westside of Gratiot, we proudly serve Roseville, Eastpointe, Saint Clair Shores, Warren, Detroit, Macomb and Wayne County. Need financing? We work with several Finance Companies & Credit Unions, & we can get you financed at a favorable interest rates. Don't get taken advantage of because of weak or bad credit! Let us go to work for you to find the right car at the right price. Give us a call, email us, or come to our showroom to see for yourself how easy and stress free the car buying experience can be. Thanks for visiting our website. Genesis Auto Sales - Great Cars at Great Prices! At Genesis Auto Sales we offer pre-owned vehicle brands such as Chevrolet, Buick, Pontiac, GMC, Cadillac, Ford, Lincoln, Chrysler, Dodge, Toyota, Honda, Nissan, Scion and others. Select the Search Vehicle Tab to see our current inventory. At Genesis Auto Sales buying a vehicle has never been easier! Financing options available for all credit tiers! Complimentary vehicle history reports available! Here at Genesis Auto sales you will find a friendly, energetic, & fun staff that love what we do & believe in the products that we sell! Our number one goal is to exceed your expectations & deliver an exceptional Sales & Finance experience. All of our vehicles are inspected, reconditioned, & are eligible for Manufacturer Extended Warranties. Ask us for details!